Whole breast radiotherapy (WBRT) is the standard therapy for early breast cancer following breast conservation surgery. WBRT reduces the risk of local recurrence and results in long-term survival similar to that obtained with mastectomy alone.,,, Tangential photon beam irradiation to the intact breast is the standard approach for the treatment of subclinical disease. However, the dose distribution is complicated due to irregularities in the chest wall contour and the varying thickness of lung tissue. In conventional WBRT, a technique using two parallel-opposed tangential fields with wedge filters is widely used., Although the International Commission on Radiation Units and Measurements recommends that the planning target volume (PTV) should be between 95% and 107% of the isodose surfaces, radiation dose homogeneity is seldom achieved in WBRT using physical wedges (PWs). In recent years, the field-in-field (FIF) technique has become a preferred method for tangential WBRT, with several reported studies of dosimetry using the FIF technique for WBRT.,,,,, However, reducing the volume receiving high doses (>107%) have been shown to result in a small increase in the tissue volume receiving < 95% prescribed dose; this trade-off is considered a disadvantage of the FIF technique. In addition to FIF, several breast irradiation techniques have been reported to improve the dosimetry distribution. These include electronic compensation and inverse planning intensity-modulated radiation therapy (IP-IMRT).,,,,, The irregular surface compensator (ISC) is an electronic compensator and a kind of forward planning IMRT (FP-IMRT). In the present study, the ISC technique with a fluence editor tool was used to improve the homogeneity of doses applied to the target volume and to decrease the dose absorbed by organs at risk (OARs) surrounding the targeted volume. Electronic compensation involves radiation beam modulation using dynamic multileaf collimators (MLCs) instead of traditional physical compensators. There are two types of electronic compensators available in the Eclipse treatment planning system (TPS). One is the electronic compensator using a straight compensation plane, and the other is it using a curved compensation surface. The ISC is the latter, and using a curved compensation surface provides better dose distributions in cases where the shape of the target volume is rounded, such as breast treatments. In addition, the fluence editor is a flexible tool which can be applied with the ISC and enables the optimization of dose distribution for individual patients by painting a fluence map. Hideki et al. 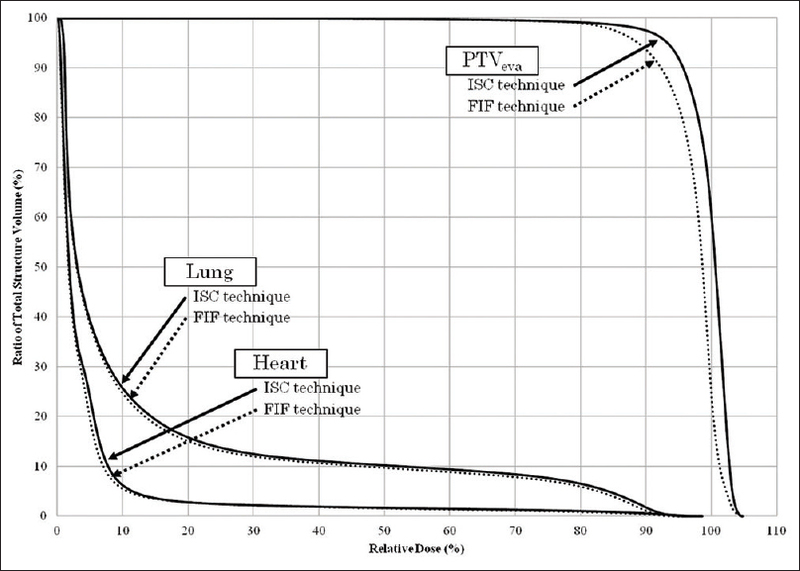 reported that the ISC technique with the fluence editor enabled significantly better dose distribution in the PTV and significantly decreased the dose applied to OARs (ipsilateral lung and heart) compared to the PW technique. On the other hand, several studies have reported that the use of FIF technique facilitates better control of dose homogeneity.,,,,, Therefore, the present study aimed to compare and evaluate the dosimetry of WBRT between the ISC and FIF techniques. Treatment plans were implemented in 25 left and 25 right breast cancer patients following conservative surgery. All patients underwent computed tomography (CT) simulation at 1-mm thickness with free breathing after they received breath coaching to maintain a regular breathing rhythm. Thereafter, CT data were transferred to the Eclipse (version 8.9, Varian Medical Systems, Palo Alto, CA, USA) TPS. The contours of both the body and ipsilateral lung were generated automatically using a contouring feature of the TPS. The radiopaque wires, heart, and clinical target volume (CTV) were contoured by a single radiological technologist in all cases. The PTV was generated by expanding the CTV by 5 mm in all directions except in the direction of the skin surface. PTV for evaluation of the dose distribution (PTVeva) was defined as the volume of PTV enclosed by contours drawn 5 mm below the skin surface to eliminate the region of dose build-up. In the present study, FIF and ISC treatment plans were designed on the TPS for each patient. The two plans for each patient used the same isocenter, tangential beam angles, and field sizes and were determined on the basis of anatomy. The anisotropic analytical algorithm (version 8.9.17) was used for dose calculation, and tissue heterogeneity correction was used in all the treatment plans. All patients were treated with 6 MV photon beams from the Clinac iX with 120 MLCs (Varian Medical Systems, Palo Alto, CA, USA), and the prescribed dose was 50 Gy in 25 fractions at the isocenter. Before the FIF and ISC treatment plans were designed, three-dimensional conformal radiotherapy (3D-CRT) planning was undertaken using two parallel opposing tangential fields without any compensators. The FIF and ISC plans were modified based on this original plan. The planning process for FIF was as follows. First, the appropriate dose level to shield was determined at 2%–4% lower than the maximum dose (Dmax) and was displayed as the isodose cloud in beams eye view (BEV). Second, either of the main fields was copied as the first subfield, and MLCs were manipulated to shield the isodose cloud on the BEV. Then, dose calculation was performed. Third, the beam weight of the subfield was added until the isodose cloud disappeared. If hot spot regions >105% of the prescribed dose remained, the process described above was repeated to achieve an optimal dose distribution. However, the edge of the MLCs was set 1 cm apart from the dose reference point and monitor unit (MU) counts were maintained above 5. Finally, if there were observable volumes of cold spot regions <95% of the prescribed dose, another subfield was added such that the opening of the MLCs fitted the regions. This subfield did not contain the reference point. The ISC plan was also modified on the basis of the original 3D-CRT plan without any compensators. We used the fluence editor in addition to the ISC. The fluence editor enables the planner to modify the fluence distribution of each field by painting a fluence map: an image visualization of the fluence distribution of a field in BEV. The process for ISC using the fluence editor was as follows. First, the ISC was applied, and dose calculation was performed. On the fluence map, values of transmission factors for hotspot regions (receiving >105% of the prescribed dose) were sampled using the transmission-measuring tool. Second, a cut range value was defined as less than the measured values to replace the transmission factors. Third, the cut range value was entered in the brush value text box, and the hot spot regions were painted. This process was performed for each field. After recalculation of dose distribution, if hot spot regions > 105% of the prescribed dose remained, the process described above was repeated to achieve an optimal dose distribution. Similarly, cold spot regions were modified by increasing the values of transmission factors. A typical initial fluence pattern is presented in [Figure 1]a, and a fluence pattern after modification using the fluence editor is presented in [Figure 1]b. The FIF and ISC treatment plans were compared objectively using dose-volume histograms (DVHs) for doses in PTVeva, the OARs, and MU counts. We evaluated each dose parameter in PTVeva: Mean dose (Dmean), Dmax, dose homogeneity index (DHI), and the proportion of volumes receiving at least 95% and 105% of the prescribed dose (V95% and V105%), respectively. 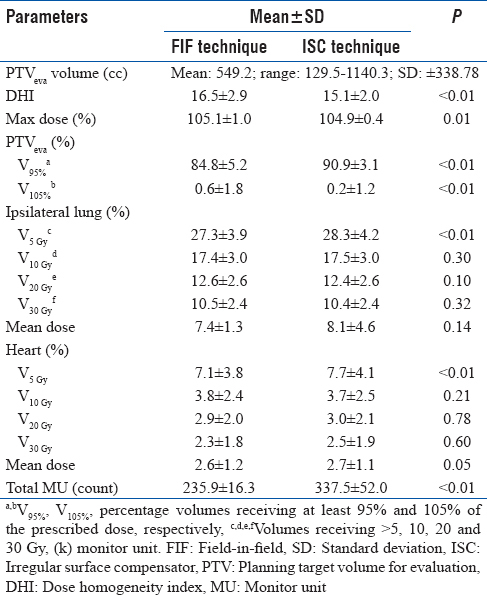 where D2% for PTVeva is the dose corresponding to 2% volume on the cumulative DVH, D98% for PTVeva is the dose corresponding to 98% volume on DVH, and Dprescription is the prescription dose at the isocenter. Regarding the OARs, the following parameters were compared: the values of Dmean and the proportion of volumes which received more than 5, 10, 20, and 30 Gy (V5 Gy, V10 Gy, V20 Gy, and V30 Gy) for the ipsilateral lung and the same parameters for the heart in the left breast irradiation. The Wilcoxon signed-rank test was used to compare each dosimetric parameter. The significance level was set at P < 0.05. Statistical analyses were performed using IBM SPSS Statistics 21 for Windows (IBM Japan, Chuo-ku, Tokyo, Japan). The results of the variation analysis of each dosimetric parameter for the 50 patients with breast cancer are listed in [Table 1]. Dose distributions obtained from representative plans for the FIF and ISC techniques are presented in [Figure 2]. Comparisons of DVHs for both the techniques of the same patient are presented in [Figure 3]. DHI with ISC was significantly lower than with FIF (P < 0.01). The ISC technique significantly increased V95% for the PTVeva and decreased V105% for the PTVeva compared with the FIF technique (P < 0.01 and P < 0.01, respectively). When ipsilateral lung and heart volumes irradiated with 5 Gy were evaluated, the FIF technique demonstrated a significant decrease compared with the ISC technique. However, no significant difference was observed when V10 Gy, V20Gy, and V30 Gy were compared. The average values of the treatment MUs for the FIF and ISC techniques were 235.9 and 337.5 counts, respectively, demonstrating a significant difference between the two techniques (P < 0.01). The FIF technique is a practical method which is widely used in radiotherapy of various sites and has become increasingly used for WBRT in recent years. On the other hand, radiotherapy planners at many institutions are unfamiliar with the ISC technique, although our institution has two expert planners. Hideki et al. reported the ISC technique as superior to the PW technique for WBRT in terms of dosimetry. Therefore, the present study aimed to compare dosimetry between the ISC and FIF techniques for WBRT. Various techniques have been developed to provide homogeneous dose distribution in PTV, including FIF, FP-IMRT, and IP-IMRT.,,,,,,,,,, For IP-IMRT planning, sufficient time and skill are required. In several studies, the Dmax of IP-IMRT has been found to be >110% of the prescribed dose,, with no significant improvement in the dose distribution of IP-IMRT-only fields. In addition, several studies have compared dosimetry between the FIF and PW techniques for WBRT, and several investigations have focused on the use of the FIF technique to improve dose distribution. However, Sasaoka et al. reported that reducing the volumes receiving >107% of the prescribed dose resulted in a small increase in the volume receiving <95% of the prescribed dose; this trade-off is a disadvantage of the FIF technique. In the present study, the FIF technique significantly decreased the volumes receiving >95% of the prescription dose compared with the ISC technique. This result is consistent with the result of the study by Sasaoka et al. Regarding the high-dose regions, the V105% with ISC was significantly lower than with FIF. As in the study by Hideki et al., the ISC technique resulted in not only a significant decrease V105% but a significant increase V95% compared with the PW technique. Thus, the ISC technique allows a reduction in hot regions without increasing cold regions, unlike the FIF technique. In general, it is considered that breasts of Japanese women are relatively small compared with western women. The mean and median breast volumes in our 50 patients were 549.2 cc and 453.8 cc, and those in the study by Tsuchiya et al. which was performed in Japan were 587.8 cc and 552.6 cc. In contrast, each mean value of the right and left breasts in the study by Fong et al. was 945.3 cc and 805.5 cc, the mean of breast volumes in the study by Donovan et al. was 1011.6 cc, and the mean and median of breast volumes in the study by Smith et al. were 1217.7 cc, and 1124.4 cc. Essentially, if the volume of the breast is large, hot spot regions are expanded in cases where the same photon beam energy is used as the depth of the reference point on the central axis is larger and MU counts are increased. Conversely, if the volume of the breast is small, cold spot regions tend to become evident. Expansion of cold spot regions indicates an insufficient dose for treatment and is directly linked to the effect of the treatment: suppression of local recurrence of breast cancer. Thus, the ISC technique is more appropriate than the FIF technique, especially for Japanese patients who have relatively small breasts compared with Western patients. The ISC technique is extremely valuable in terms of compensation for insufficient doses. With regard to the energy, we do not limit the energy for WBRT to 6 MV, although 6 MV X-ray beams were used for all plans in this study. The linac in our institution can irradiate an X-ray beam of 6 MV or 10 MV, and some patients for WBRT were irradiated using 10 MV beams before this study because of especially large breasts. However, the 50 patients for this study were chosen at random, and there were no patients who needed the plans of 10 MV beams in these patients. We consider that 6 MV is more suitable for WBRT than 10 MV because the build-up region of 10 MV X-ray is larger than 6 MV X-ray. In most cases, breasts of patients in our institution are not so large that 10 MV is required. In a study by Tsai et al., ISC was demonstrated to provide improved dose homogeneity compared with the PW technique. However, the dose distribution was only slightly improved, and the Dmax was >105% of the prescribed dose. We demonstrate that the ISC technique can sufficiently improve dose homogeneity: not only reducing the Dmax to <105% of the prescribed dose but also increasing doses applied to cold spot regions. In our studies, the fluence editor was used to modify the dose distribution; the production of painting fluence maps led to appropriate dose distributions for individual patients. We consider that sufficient improvement in dose homogeneity using the ISC technique is dependent on the efficacy of the fluence editor although sufficient skill is required. In general, extremely small MU and reference points near the edge of a field cause larger errors in exposure dose. Therefore, our institution guidelines state that the minimum MU should be >5 and that the edge of MLCs is set 1 cm apart from the reference point. In the present study, the main objective of planning was that the Dmax achieved <105% of the prescription dose with both the FIF and ISC techniques. However, the objective was often not achieved during FIF planning due to our institution guidelines. On the other hand, the values of Dmax with ISC plans were under 105% of the prescription dose in almost all patients. These factors caused significant differences in V105% and Dmax between the two techniques. Nevertheless, the average Dmax was lower than 107% with both the techniques, and the difference between the techniques was slight. Considering this result, both the ISC and FIF techniques allow sufficient improvement in hot spot regions. Accordingly, the ISC technique has a great advantage in terms of cold spot regions. WBRT for early breast cancer can reduce the risk of death but usually involves some irradiation of the heart and lung. In the present study, there were no significant differences in the dose applied to the ipsilateral lung and heart between the two techniques except for V5 Gy. Regarding V5 Gy, the FIF technique was significantly lower than the ISC technique. However, the dose of 5 Gy was relatively small. Therefore, it is not possible to assume that the use of the ISC technique increases the risks of side-effects on the ipsilateral lung and heart compared with the FIF technique. Regarding MU counts, there was a significant difference between the ISC and FIF techniques, and the difference between the averages was approximately 100. That is to say, the time required for irradiation using the ISC technique is approximately 10 s longer per field than with the FIF technique if the dose rate is 600 MU/min. However, irradiation using the FIF technique requires time for interruption during movement of MLCs between the main field and subfields. There is no clinical issue related to treatment time with either technique. The following explanations are about the limitations of this study. Intra- and inter-fractional breast motions influence dose distribution, although we compared the two techniques without including the influence of them. Several studies have revealed that breast movements can affect the dose distribution with dynamic IMRT., However, Furuya et al. concluded that the effects of dose distribution were relatively small when the factors of respiratory motion and setup error were evaluated simultaneously. In any case, careful attention to breast movements is necessary in WBRT. In our institution, as a countermeasure for intra-fractional motion, the patients received breath coaching before CT scanning and radiation therapy As a countermeasure for inter-fractional motion, we voluntarily took kV and MV images for patient positioning when the skin markers were faded, and that was performed once a week in most cases. The ISC technique with a fluence editor allows significant improvements in dose distribution in WBRT compared with the FIF technique. The ISC technique significantly decreases cold spot regions while suppressing Dmax equal to or less than the FIF technique. This represents a great advantage over the FIF technique. Regarding OARs, there was no significant difference in the majority of items between the two techniques, with no difference in the risks of side effects. Therefore, we conclude that the ISC technique is useful for WBRT. Clark RM, Whelan T, Levine M, Roberts R, Willan A, McCulloch P, et al. Randomized clinical trial of breast irradiation following lumpectomy and axillary dissection for node-negative breast cancer: An update. Ontario clinical oncology group. J Natl Cancer Inst 1996;88:1659-64. Veronesi U, Salvadori B, Luini A, Greco M, Saccozzi R, del Vecchio M, et al. Breast conservation is a safe method in patients with small cancer of the breast. Long-term results of three randomised trials on 1,973 patients. Eur J Cancer 1995;31A: 1574-9. Early Breast Cancer Trialists' Collaborative Group. Favourable and unfavourable effects on long-term survival of radiotherapy for early breast cancer: An overview of the randomised trials. Lancet 2000;355:1757-70. Prescribing, Recording and Reporting Photon Beam Therapy Report No. 50. Bethesda, Maryland: ICRU; 1993. Sasaoka M, Futami T. Dosimetric evaluation of whole breast radiotherapy using field-in-field technique in early-stage breast cancer. Int J Clin Oncol 2011;16:250-6. Tanaka H, Hayashi S, Hoshi H. Determination of the optimal method for the field-in-field technique in breast tangential radiotherapy. J Radiat Res 2014;55:769-73. Ercan T, Iğdem S, Alço G, Zengin F, Atilla S, Dinçer M, et al. Dosimetric comparison of field in field intensity-modulated radiotherapy technique with conformal radiotherapy techniques in breast cancer. Jpn J Radiol 2010;28:283-9. Onal C, Sonmez A, Arslan G, Oymak E, Kotek A, Efe E, et al. Dosimetric comparison of the field-in-field technique and tangential wedged beams for breast irradiation. Jpn J Radiol 2012;30:218-26. Murthy KK, Sivakumar SS, Davis CA, Ravichandran R, El Ghamrawy K. Optimization of dose distribution with multi-leaf collimator using field-in-field technique for parallel opposing tangential beams of breast cancers. J Med Phys 2008;33:60-3. Al-Rahbi ZS, Al Mandhari Z, Ravichandran R, Al-Kindi F, Davis CA, Bhasi S, et al. Dosimetric comparison of intensity modulated radiotherapy isocentric field plans and field in field (FIF) forward plans in the treatment of breast cancer. J Med Phys 2013;38:22-9. Emmens DJ, James HV. Irregular surface compensation for radiotherapy of the breast: Correlating depth of the compensation surface with breast size and resultant dose distribution. Br J Radiol 2010;83:159-65. Tsai SH. A Dosimetric Comparison of Electronic Tissue Compensation and Conventional Wedge Field Technique in Treating Breast Cancer. College of Science and Health, Medical Dosimetry Program, University of WisconsinLa Crosse, MS Thesis; 2012. Su M, Ayzenberg V, Li W. Dosimetric parameter comparison of the electronic tissue compensator technique with the conventional physical wedge technique for the whole breast treatment. Med Phys 2008;35:2837. Descovich M, Fowble B, Bevan A, Schechter N, Park C, Xia P, et al. Comparison between hybrid direct aperture optimized intensity-modulated radiotherapy and forward planning intensity-modulated radiotherapy for whole breast irradiation. Int J Radiat Oncol Biol Phys 2010;76:91-9. Caudell JJ, De Los Santos JF, Keene KS, Fiveash JB, Wang W, Carlisle JD, et al. A dosimetric comparison of electronic compensation, conventional intensity modulated radiotherapy, and tomotherapy in patients with early-stage carcinoma of the left breast. Int J Radiat Oncol Biol Phys 2007;68:1505-11. Hideki F, Nao K, Hiroyuki H, Hiroshi K, Haruyuki F. Improvement of dose distribution with irregular surface compensator in whole breast radiotherapy. J Med Phys 2013;38:115-9. Frazier RC, Vicini FA, Sharpe MB, Yan D, Fayad J, Baglan KL, et al. Impact of breathing motion on whole breast radiotherapy: A dosimetric analysis using active breathing control. Int J Radiat Oncol Biol Phys 2004;58:1041-7. Tsuchiya K, Kinoshita R, Shimizu S, Nishioka K, Harada K, Nishikawa N, et al. Dosimetric comparison between intensity-modulated radiotherapy and standard wedged tangential technique for whole-breast radiotherapy in Asian women with relatively small breast volumes. Radiol Phys Technol 2014;7:67-72. Fong A, Bromley R, Beat M, Vien D, Dineley J, Morgan G, et al. Dosimetric comparison of intensity modulated radiotherapy techniques and standard wedged tangents for whole breast radiotherapy. J Med Imaging Radiat Oncol 2009;53:92-9. Donovan EM, Yarnold JR, Adams EJ, Morgan A, Warrington AP, Evans PM, et al. An investigation into methods of IMRT planning applied to breast radiotherapy. Br J Radiol 2008;81:311-22. Smith W, Menon G, Wolfe N, Ploquin N, Trotter T, Pudney D, et al. IMRT for the breast: A comparison of tangential planning techniques. Phys Med Biol 2010;55:1231-41. Xing L, Crooks S, Li JG, Ozhasoglu C, Chen Y, Metha V, et al. Incorporating respiratory motion into the design of intensity maps in IMRT treatment of breast cancer. Int J Radiat Oncol Biol Phys 2000;48:199. Cao J, Roeske JC, Chmura SJ, Salama JK, Shoushtari AN, Boyer AL, et al. Calculation and prediction of the effect of respiratory motion on whole breast radiation therapy dose distributions. Med Dosim 2009;34:126-32. Furuya T, Sugimoto S, Kurokawa C, Ozawa S, Karasawa K, Sasai K, et al. The dosimetric impact of respiratory breast movement and daily setup error on tangential whole breast irradiation using conventional wedge, field-in-field and irregular surface compensator techniques. J Radiat Res 2013;54:157-65.